Although Rosa is weakening off the coast of Baja California, Mexico, it's still strong enough to trigger a flash flood watch for Las Vegas and Phoenix. Parts of the Southwest are bracing for possible flash flooding as Hurricane Rosa slowly spins northeast over the Pacific Ocean. The national Hurricane Center reduced Rosa to a tropical storm on Sunday as it weakens off the coast of Baja California, Mexico. But it remains strong enough to trigger a flash flood watch for Monday and Tuesday in Phoenix, where its remnants are headed, the National Weather Service said. 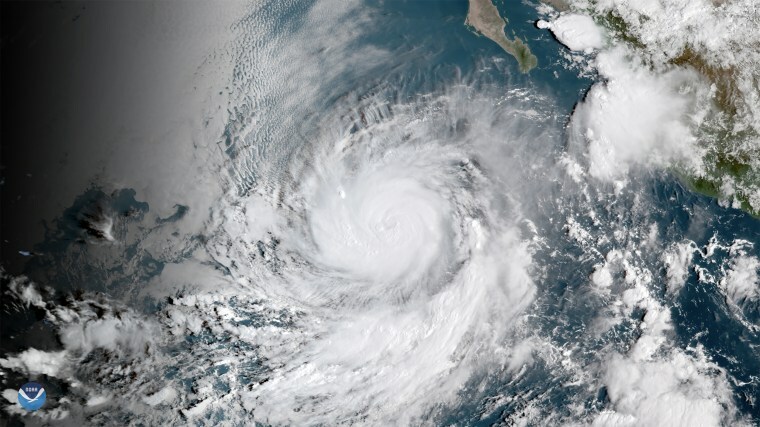 Rosa was expected to make landfall over northern Baja on Monday and continue to break up as it moves northeast to the deserts of Nevada and Arizona, forecasters said. "Abundant tropical moisture from Hurricane Rosa will be drawn up from the coast of western Mexico into southern Nevada and surrounding states leading to the potential for heavy rainfall and flash flooding Monday afternoon through Tuesday night," the National Weather Service in Las Vegas said in a statement. Forecasters were warning Las Vegas residents to expect as much as three inches of rain an hour Monday through Wednesday. Much of Arizona could receive a total of four inches of rain, high winds and flooding in the same period. Areas that could be in for heavy conditions include the Arizona cities of Flagstaff, Payson and Prescott and the Grand Canyon’s South Rim, weather officials said. Up to six inches was possible at the canyon’s North Rim. Rosa was a Category 4 hurricane on Thursday, but it was downgraded to a Category 2 by Friday night. Rosa's remnants could send rain up the Pacific coast to San Diego and Los Angeles early next week, the weather service said. San Diego could receive as much as three-quarters of an inch of rain and parts of Los Angeles a half-inch, which are healthy amounts during Southern California's traditional fall fire season, said weather service meteorologist Carol Smith. Chances of it happening were 40 to 60 percent, Smith said. It would be the first real rain of the Southern California season, which usually peaks in February, she said. The possible precipitation could be accompanied by higher than normal humidity that comes with tropical fronts, she said. Meanwhile, Rosa is cranking out high surf that is expected to reach the beaches of Southern California from Saturday through Monday. The surf forecast for Orange County included the possibility of 10-foot sets by Saturday night, the weather service stated. "There's definitely going to be some surf," Smith said.